Oleg Benesch, a Lecturer in East Asian History at the University of York and a graduate of the Asian Studies PhD program, is returning to UBC to offer a lecture based on his book Inventing the Way of the Samurai: Nationalism, Internationalism, and Bushido in Modern Japan. Please join us on March 17 from 3:30 to 5:00 pm in CK Choi 120. 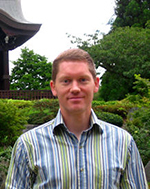 The talk will be hosted by Peter Nosco and cosponsored with the Centre for Japanese Research.